Only days ago I posted a list of my favourite Woody Allen films. This afternoon I have finally watched Midnight in Paris. I adored it. It is a film that has left me, and two of my dearest friends, beaming from ear to ear. It is worthy of a position in my top ten favourite Woody Allen films. However, the list has been made and I can not bring myself to lose any of the films that already feature in the list. It will have to be a top eleven. Woody Allen has such a gift for bringing out the best in his actors and actresses. Owen Wilson, an actor who is usually so flat and uninteresting, once given a complex and likeable character to play, comes into his own. Here we see Wilson merge into the classic ‘Woody’ protagonist that we have come to love and expect. Rachel McAdams plays a frustratingly self-obsessed lead female and immerses herself well within the dialogue. It was also a delight to watch Michael Sheen create the comically arrogant Paul. There is no question in my mind; Allen has created a new masterpiece. Even today he is proving he deserves his place in American cinema, to Hollywood’s great distaste. 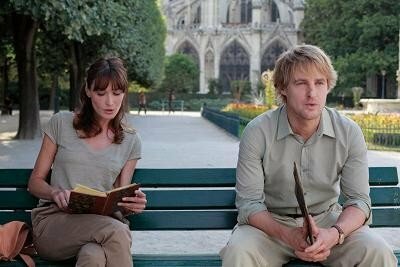 Midnight in Paris not only charmed and smouldered upon the screen, but it left me with a longing to indulge in expensive wine with a good Hemingway book. Tags: Midnight in Paris, Woody Allen. Bookmark the permalink.